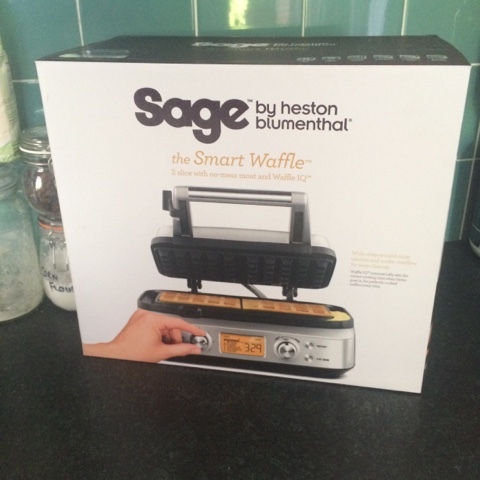 I was lucky enough to recently win a Sage by heston blumenthal Smart Waffle. This waffle machine, blows others out of the water. All the guess work is taken out of you deciding if your waffles are cooked enough, leaving you with perfectly browned, easy to remove waffles each & every time. The controls are simple to operate and easy to understand. Depending on your mix you first choose between Belgian, Classic, Chocolate, Buttermilk or Custom and the preferred finish of your waffle, ranging from light to dark. The smart machine will beep to tell you when it is hot enough to cook on. There's even a "little bit more" button so that if your waffles are not quite browned enough it will give another little cook to increase the crispiness. Perfectly cooked, perfectly crispy, blank canvas ready for you to add your toppings too. I added fresh fruit, low fat yogurt & a drizzle of honey for one option, then cranked up the calorie count by cooking grilled bacon, caramelised banana & syrup for a really filling Sunday brunch. One batch of batter was enough to make seven waffles so I froze some to defrost the following weekend. Warmed through under a low grill they tasted just as good as a fresh batch. Now many gadgets are fun to use, but a nightmare to clean afterwards. Not so the Smart Waffle. The photo below was taken straight after I lifted out my last pair of waffles. No stuck bits, no raw batter. Just a quick wipe with some kitchen roll and we're all set for next time. 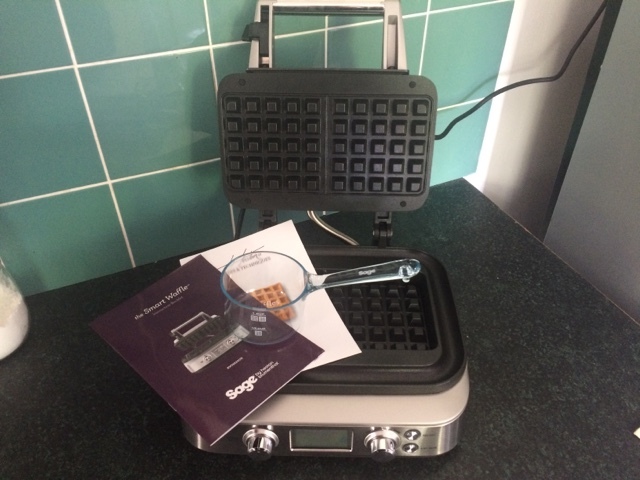 The Sage by heston blumenthal Smart Waffle retails for £169.95. Trust me when I say "you get what you pay for". Not just for traditional waffles, you could use it to make potato waffles, hash browns, even omelettes. This is one appliance that will be kept on our work surface - definitely not forgotten in a cupboard! Despite winning this waffle machine in a competition, I have lusted after one for a long time! I was not asked to write a review. All words and thoughts are my own opinions. Now that is a waffle maker! I got a small one but everything just runs over the side no matter how much mixture I put in. If I put not enough then the waffles are thin and rubbish. Yours look wonderful! I am so impressed with how easy to use this machine is Stephanie - my run over slightly too - but the excess gets cooked too so you get a little extra waffle puddle to eat!! Thanks Kim, we did have to limit ourselves to one batch the first weekend we had it!! Thanks Kate - they've become a favourite of ours too! !